Jason Cummings strokes home the last-gasp penalty which gave Posh victory at Charlton. Photo: Joe Dent/theposh.com. Peterborough United gained revenge for last season’s heartbreak at the Valley by nicking three points at the same venue with an 89th-minute penalty tonight (August 21). Posh were 2-0 up heading into injury time in this fixture last term and ended up with a point. Jason Cummings is off celebrating with George Cooper after scoring for Posh at Charlton. Photo: Joe Dent/theposh.com. But this team is much stronger mentally and physically and they survived intense second-half pressure from a powerful Charlton outfit before breaking out of defence to fashion a winning goal in the dying stages. Credit manager Steve Evans for gambling on a victory. He sent on a rusty, and presumably not match fit, Marcus Maddison along with striker Ivan Toney with half an hour to go and the latter was fouled trying to reach a superb cross from the former. Jason Cummings rolled the spot kick into the corner to secure a fourth straight League One win. 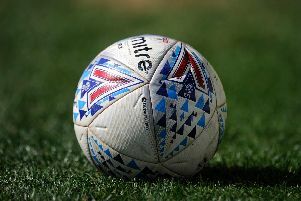 Evans’ threat to break up a winning side proved a false one as the same starting line-up took to the field for the fourth League One match in a row. Charlton fielded wing-backs and three centre-backs as Luton had done rather unsuccessfully at the weekend, but tonight’s hosts kept them high up the pitch to try and deter Posh wingers Siriki Dembele and Joe Ward from venturing too far forward. It didn’t work in Dembele’s case as the winger again delivered some impressive moments, particularly in the middle part of the first-half which Posh dominated. It was Dembele’s corner that Rhys Bennett headed against the underside of the crossbar, the ball rebounding off goalkeeper Dillon Phillip’s legs and behind for a corner. Bennett headed another corner over the bar, while Posh also won a host of free kicks as Charlton discovered a rather cynical way to stop Dembele. The home side took two cautions on the pitch and one off it as manager Lee Bowyer was shown the yellow card by referee James Linnington for contesting one decision too loudly. Linnington was almost back in Bowyer’s good books when playing a good advantage to allow Lyle Taylor a shot at goal that was saved by Posh ‘keeper after a helpful deflection. Charlton finished the half well on top with Taylor pulling a 16-yard shot wide from a corner from their best scoring opportunity. It was the first League One match this season Posh hadn’t been leading after 45 minutes. That could be why Evans was apparently cautioned in the tunnel for ‘his behaviour towards the officials’. But they almost struck at the start of the second period when Joe Ward’s cross found Cummings free in the penalty area, but he glanched his header wide. However Charlton soon found their stride again and it took good reactions from Bennett and then a fine block from Jason Naismith to keep them at bay. Posh reacted by sending on Maddison for his first outing of the season along with Toney just past the hour mark. And Toney’s first touch of the ball sent Dembele racing through, but Phillips saved. Colin Daniel was the next to threaten after making an interception, beating a defender and firing just wide from outside the area. Cummings then scampered along the byline before his cross was scrambled clear. But Charlton threw former Posh striker Nicky Ajose on to the pitch and they went back on the attack forcing numerous corners and set pieces. Naismith did well to turn a top cross behind and from the corner Alex Woodyard made a superb block to keep out Taylor’s impressively struck half volley. There was still time for Tafazolli and Mark O’Hara to make strong blocks before Posh could celebrate the goal that kept them to of the table with a perfect winning record. Posh: Aaron Chapman, Jason Naismith, Colin Daniel, Rhys Bennett, Ryan Tafazolli, Alex Woodyard, Mark O’Hara, Joe Ward (sub Marcus Maddison, 62 mins), Siriki Dembele (sub George Cooper, 83 mins), Matt Godden (sub Ivan Toney, 62 mins), Jason Cummings. Unused substitutes: Mark Tyler, Louis Reed, Callum Cooke, Josh Yorwerth. Morgan (sub Nicky Ajose, 66 mins), Karlak Grant, Joe Aribo, Lyle Taylor. Unused substitutes: Jed Steer, Anfernee Duksteel, Mark Marshall, George Lapslie, Taylor Maloney, Reeco Hackett-Fairchild. Goal: Posh - Cummings (pen, 89 mins). Cautions: Posh - Woodyard (foul), Evans (manager, dissent), Maddison (unsportsmanlike conduct). Charlton - Morgan (foul), Pratley (foul), Bowyer (manager, dissent), Taylor (dissent).